Taken on a frosty morning at first light in late October 2008, NGR SN7539440023. Ysgoldy Fach (Little School) is an old school house, which backs onto St.Michael's Church in the village of Cilycwm. 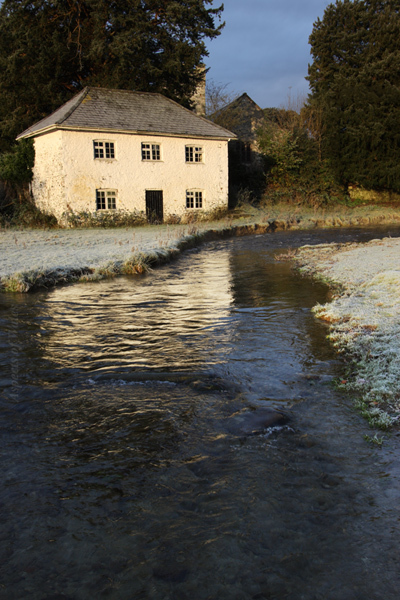 The stream is the Gwenlais, a tributary of the Afon Tywi/River Towy. Canon EOS 40D, Canon 10-22mm lens, Manfrotto tripod. Exposure F11 at 1/15sec, 1/30sec and 1/60sec combined. Original image in Raw format.